The Right Sector emerged during Ukraine's winter Euromaidan protests and is controversial because of their right wing ideology and advocating the use of force. Teenagers in the Carpathian Mountains are helping Ukraine’s war effort. They’re collecting funds, buying supplies, and driving them to the other end of their country where the fighting is. I heard about this during my weekend trip to a picturesque village that I’ve been visiting for years from a 19-year-old blond woman who just obtained her teaching certificate. She's been volunteering for months, despite her grandmother’s and brother’s disapproval. At first she didn’t want to talk to me about it, not knowing how I’d react. Opinion in the village is divided. Some, like her, are doing what they can to oppose Russian aggression against Ukraine. Others can’t understand why men are fleeing from the east to Western Ukraine, rather than defending themselves against pro-Russian armed separatists and Russians who are invading and killing. The Right Sector emerged during Ukraine’s winter Euromaidan protests and is controversial because of their right wing ideology and advocating the use of force. But they've been active in opposing Russia’s war against Ukraine. "I know that guy’s not part of the Right Sector,” said the young woman. I remember hearing stories from the elderly woman's brother about what had gone on in that village during the Second World War. He'd showed me the basement where he and his high school buddies hid Ukrainian partisans who were fighting against the Red Army. There's no fighting in the Carpathian Mountains today, and his great-niece is not sheltering partisans. She's applying to university in the fall, and going abroad for the summer. But she inherited her great-uncle’s spirit, and is now helping to send supplies to men who are not running away from -- but going into -- the zone of combat and resisting an invading aggressor. Article: Courtesy Oxford Research Group Creative Commons License 3.0. 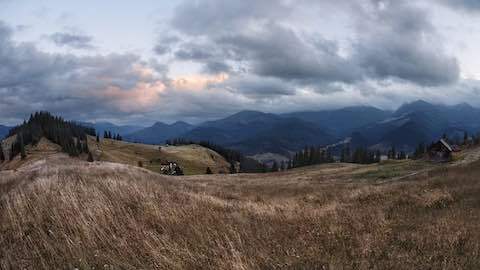 "War Echo in Ukrainian Mountains"